"A superb story - blogging works!" As you read yesterday, Shades and the Overstuffed Baby made a connection. I was contacted by Dorothy Gray's granddaughter, Emelie Williams, who wrote and has sent Shades photographs of Dorothy's life, bringing our story full circle. I was bowled over when her baby photo came on my monitor. God love the internet and people who love history. We are fortunate to have quite a lot of photos from Dorothy's side of the family. 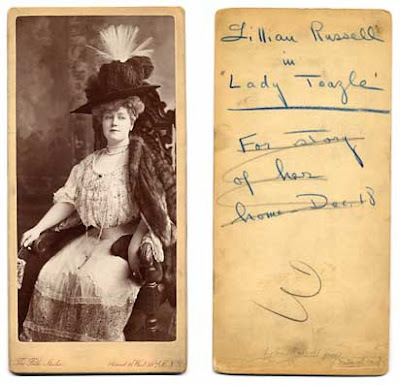 She kept scap books that have some portraits of family members and also some of Virginia City, Tonapah and Goldfield. I must say that your detective work on her photograph was very accurate and your methodology may prove helpful as we are piecing together some of our unknown people. 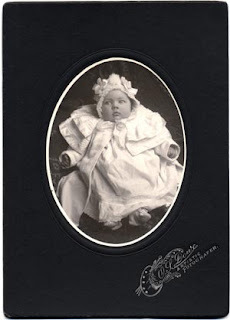 She was indeed born June 20, 1907 in Goldfield, so your theory that she was about 6 months old was correct. They were Catholic and that looks like a Christening gown. So your thought about going to Silver City has great possibilities. I will look forward to reading more about preserving, sleuthing, researching and opening up the paths to the past in your future issues. Emelie, the thanks is all mine. Yes, the internet is a wonderful place and this story is proof that we all have the opportunity to make a connection, to break down a brick wall, to come full circle. Yes, thank you Emelie, for contacting Shades and for being so generous with your family history. It was such a pleasure to find that the research of a photograph of a baby with nothing more than a name resulted in such accurate work. It is so encouraging. And now, it is on to preserving, sleuthing, researching and opening up the paths to the past. It is the reason why we do the things we do! Thank you for posting this! Believe it or not, Dorothy was my grandmother. She died last April (2010) in Reno, Nevada at age 102. Her eyes were always her most noted feature -- clear, sky blue eyes. She was proudest of being a native Nevadan. Her grandparents from both sides immigrated in the 1850s and 1860s for the gold and silver rush and she was the second generation born in the US. 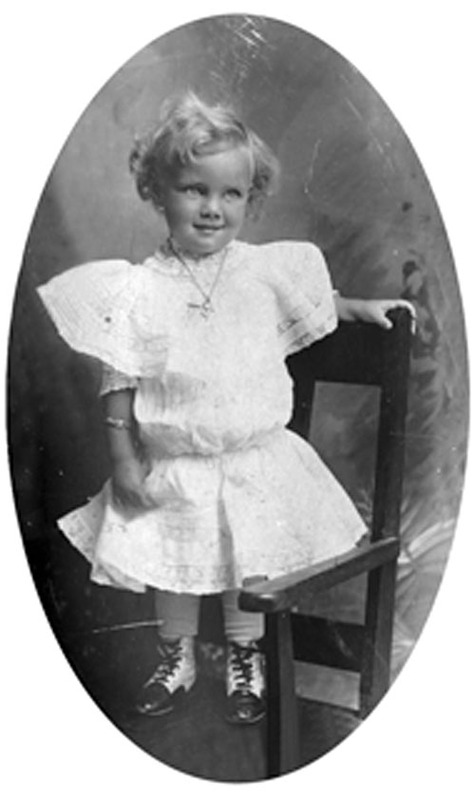 Dorothy was loved and adored by her parents as she was the only child to survive beyond age 4. Four sons did not due to childhood illnesses. 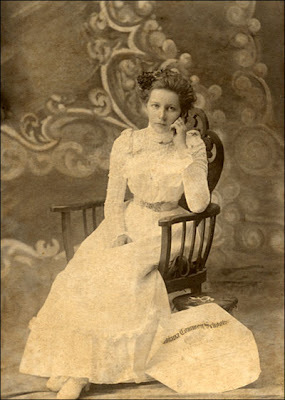 Her uncle, William Counihan was a miner from Virginia City and moved to Montana for their mining rush. I suppose this is how baby Dorothy's photo got to Montana. Dorothy still has three children aged 77 to 82 who are researching their past. Thank you so much Emelie for telling us the story of baby Dorothy! We research, we write, and sometimes we are rewarded. 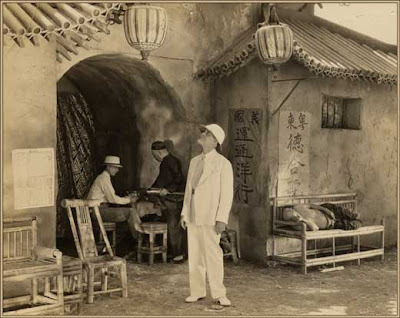 Today's Twitter #ShadesOP is an interesting orphan photograph with several clues. I purchased the photograph in an antique store in Missoula, Montana. 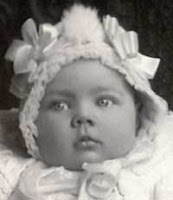 The staff had lovingly nicknamed the photograph "overstuffed baby," and you can see why. A photograph found with this one has written on the reverse, "Everywhere you go there's someone to take your picture." Usually those taking the photographs were Holmes and Greene. E. Burton Holmes and E. Jesse Greene traveled the world together taking photographs and making films for the Burton Holmes empire. Always, I might add, dressed to the nines no matter where they were in the world. Burton Holmes was a mega star of his day; for sixty years he was America's most famous travel showman. Yes, Burton Holmes traveled the world, but he didn’t travel alone. Producing the Burton Holmes lectures required the efforts of a close knit group of tough ground-breaking professionals. While much has been written about Burton Holmes’ career, little has been known about the men and women who traveled with him and contributed to his empire. One of those men was my grandfather, Edward Jesse Greene. Greene left school at sixteen to begin his career with Holmes. 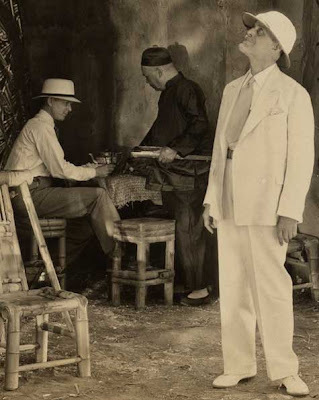 Burton Holmes personally gave my grandfather an education in photography, travel, and the world. The stories of my grandfather and his association with Holmes, as well as his personal photographs are my legacy. The George Eastman House has acquired several hundred of Holmes' films and is working to preserve his legacy. They have released the following video. Issue of Shades published this week! Shades reprints a chapter from the book on Occupations For Women, describing Women and Photography. Don't miss Shades Of The Departed Magazine - out this week with a look at occupational photographs. PHOTOGRAPHY is especially adapted to a woman's artistic taste and delicate touch. Many girls practicing photography as amateurs, do their work well and it seems unaccountable why so many who reach a creditable degree of excellence in the work should be satisfied and so cease to produce better results. Why should they not continue in the art, master every detail, enter the field as professionals, and pursue the work as a business? Hundreds of women might accomplish far more in this occupation than at present. Is it lack of energy, of courage or capital that deters them? It cannot be lack of energy, for the hours spent in the work by the ambitious, enthusiastic and painstaking amateurs prove the contrary. It should not be on account of insufficient courage, for it has been said that "the business woman is a nineteenth century production. She is honestly proud of her work, and of being a link in the great chain which keeps the business world moving." The hesitation should not be based upon the plea of "no capital," for the bright, determined girl of the present will always overcome this difficulty. The work is not too difficult for a woman. For years it was regarded as a particularly occult and mysterious process, requiring a special gift, a knowledge of chemistry and years of professional study. During these years photography, to the woman, suggested untidy work, blackened hands, and soiled aprons. Today it is acknowledged to be a fascinating work, easily understood, requiring no superior knowledge, and demanding but a comparatively short time of study and preparation. The introduction of electric lights, dry plates, light machinery, and dainty photographic devices renders the work more agreeable and available to women besides offering at the present day a most inviting field. Nearly two-thirds of a photographer's patrons are women and children, and a woman photographer of pleasing manners, obliging disposition and artistic sense is most successful in securing happy results when the critical moment of posing arrives. There is but one best position, one best view of all objects. It is acknowledged that in woman the artistic sight is more perfectly developed than in man. This natural gift enables her to immediately discover the one best position--the one best view of her subject. A woman quickly grasps the beautiful and harmonious in nature and in art. She naturally understands posing, colors in dress, and all the details that make up the artistic photographs of women and children. She will quickly tell why this line, shade or curve is more desirable. She possesses the faculty of bringing out the best in the patron who poses before her. Many years elapsed in the history of photography before the public became assured of these neutral gifts in women--gifts so admirably adapted to this work, so favorably suited to its success. The photographers in several of our cities were assured of woman's efficiency in this work after securing her aid in their studios. 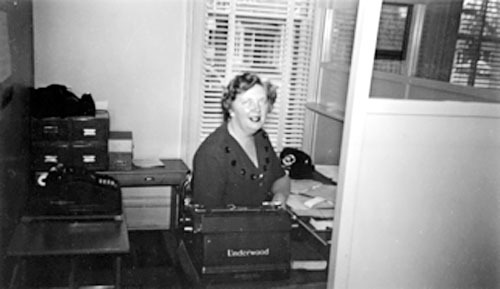 It was when thus employed as assistants that women fully realized their adaptability, discovered opportunities for improvement, and resolved to pursue the work as a profession. Mrs. Julia Cameron, of England, early realized that the ideal portrait consists in portraying a glimpse of a man's soul; not only the face but the intellect, the genius, the spirit in its completeness--these must all enter into the faithful portrait. This she aimed to accomplish and seldom has the work been more satisfactorily accomplished. She produced portraits which were an immediate inspiration to others who were striving to do sincere and truthful work. It is said: "She was of a most distinguished and fine nature, and was of unique pre-eminence in the profession of which she has made a great and noble name." Tennyson was her neighbor, and often he posed for her. The faces of Browning, Carlyle, Sir John Herschel, Charles Darwin and Tennyson were among her noblest of English portraits. In these she succeeded in portraying the loftiest aim and the utmost steadfastness which were the principles of their lives. It is this that vivifies their portraits. "When I have had these men before my camera," she once said, "my whole soul has endeavored to do its duty toward them in recording faithfully the greatness of the inner as well as the features of the outer man." This is the secret of her power and her success: "Truth in art for truth's sake." It has been said that her work merits comparison only with the best portraits from the old masters. London to-day has the most celebrated woman photographer in the world. 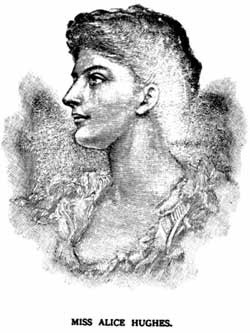 Miss Alice Hughes, the daughter of Edwin Hughes, the portrait painter, has earned this enviable reputation. Her photographs are more expensive than any others produced in London, and yet she is scarcely able to attend to her orders. Her work is all done at her home in Gower street, London, and here there are no surroundings usually associated with photographic galleries, No outward sign on portal or windows suggests the atelier. Her studio is built out over the garden and from the drawing-room one descends to it by three or four steps. The secret of her success is that she makes her subjects perfectly at ease. She lets them pose themselves and makes only the changes that are absolutely necessary. 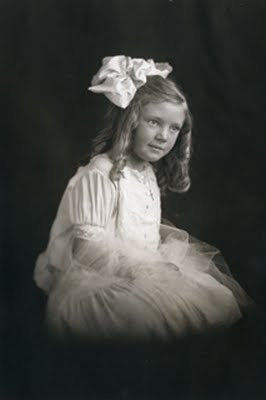 Among her photographs are nearly all of our American girls who married Englishmen, from Lady Randolph Churchill to Lady Terence Blackwood. 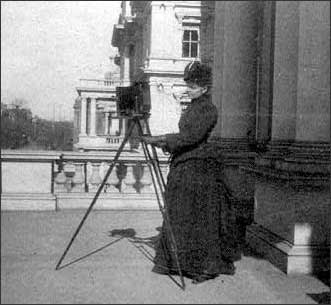 Mrs. Emily Stokes of Boston, is an example of what a woman may accomplish in photography. When compelled by misfortune to give up her London home, she came to America to begin life among strangers. Having been associated with enthusiastic photographers in England, and believing that the position could be filled by women as well as men, she resolved to enter the field as a professional. For sixteen years she has aimed to produce the true child portrait. She has conquered difficulties, and is an enthusiastic and successful artist. "This one thing I know," she said brightly, and it would be well if many girls could say the same. "I know every detail of the work; it is the only way to success," she added, as she glanced about the room at the pictures of sweet child faces. 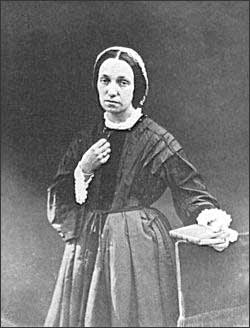 Since the first public exhibition of photographs in London in 1852, and especially since the Paris Exposition in 1889, photography as an art has steadily advanced, and in the recent exhibitions in European and American cities the photographs executed by many women have been an inspiration urging others to enter the field. Not only have these women exhibited portraits, but their photographs of landscapes, marine views, mineral and vegetable specimens have won for them a wide reputation. Some of the most beautiful photographs in the United States have been produced by Miss Johnston, of Washington. She has attained a superior degree of excellence in all her work. As a professional she ranks among the list of leading photographers in the country. The truthfulness and artistic beauty in all her photographs have earned for her a name pre-eminent among photographers. She has done much work for newspapers and magazines, giving to the public truthful pictures of much that is constantly occurring in the public life of the capital city. Miss Beatrice Tonnesen, of Chicago, has opened a studio in that city, and her photographs of women and children, especially the latter, are already noted for their beauty. 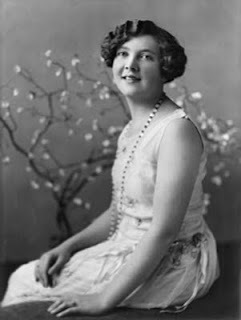 Mrs. Farnan, a California woman, has earned the reputation of accomplishing remarkable results in photography. In February, 1896, the Youth's Companion offered prizes for the eight best amateur photographs submitted during the following six months. Over six thousand photographs were received in response to the offer. 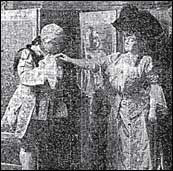 Miss Emma Farnsworth, of Albany, N. Y., submitted a most truthful scene, "When the Day's Work is Done." This was awarded the first prize, and strikingly illustrates the perfection to which a young woman has brought her art. 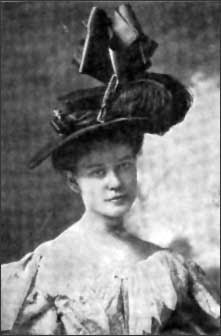 Others who obtained prizes were Mrs. Sarah Holm, of Wisconsin, and Miss Kate Matthews, of Kentucky. The girl who decides to leave the army of amateurs and enter the professional arena must feel assured that she has patience, an artistic taste, determination and business ability. She must be willing to inform herself of the multitudinous operations to be performed; she must expect waste and loss, and she must be able to rise above disappointments and trials. To be successful in working a "four-by-five" outfit does not imply an equal success with an "eighteen-by-twenty-two." The ability to make a few blue-prints daily does not mean equal success in producing five hundred to one thousand a day in albumen, ilo or platinotype[.] To be able to please a few interested, intimate friends is widely different from contending with the capriciousness of disinterested strangers. To take a picture and secure a local artist to do all the work requires little ability when compared with understanding the operating, printing, mounting and finishing. Possession and production are widely different in their meaning. It is one thing to work for pleasure and one's self and quite another to work for profit and the public. Too often a girl thinks if she buys a camera, some plates and a few chemicals she can become a photographer. In her mind all that is necessary is to expose the plate properly, develop it, print from it, tone and fix the prints, and then the art will be mastered. She forgets that few can expose a plate with perfect success, that judicious, painstaking care is necessary to develop it, and that toning requires skill. It must not be supposed that with the cheapness of material and the present comparative simplicity in applying it, the pictures require less care than formerly. The conditions of light and composition are the same as they were in the early days of photography, and the laws of lenses and theories of light must still be studied with the greatest care. The girl who would be a photographer should consider her adaptability for the work, and, having decided to pursue the occupation, she will do well to work with some reliable firm. When once an opportunity is found in some photographic studio she must work earnestly and hard in learning the details of the work. After a short time is given she will obtain a position as assistant in the work. If she be on the alert for opportunities she will, when fitted, find the right locality and here build up a business of her own. The cost of materials, furniture, rent, wages and the fund for emergencies must then be considered. One young woman of the East fitted up a skylight for fifty dollars. The expense incurred will vary according to the taste of the young woman. Once furnished and equipped the subsequent outlay is but trivial, and if good work is furnished the profits are assured. A young woman may choose to devote herself to but one branch of the work. Should she excel she will find with determination the opportunity of assisting in some large studio. The operator and the one who poses the subject hold positions of importance and responsibility and are usually paid the highest salary. An education in photographic science is required, a knowledge of light and its effects, an artistic taste, and a knowledge of theories that constitute art in portraiture. Women who excel in these, who are professionals, will receive from fifteen to fifty dollars a week. Especially adapted to a woman's delicate touch is the process of retouching photographic negatives. Before entering upon this branch of the work it is essential that she should draw and possess a knowledge of anatomy, especially of the face, neck and shoulders. If the work be undertaken without this knowledge, distorted, unnatural productions will be shown, and failure will result. The work also requires strong eyes, for the use of artificial light is a constant strain upon the eye. The amount paid for this work in large cities varies from ten to fifteen dollars a week. Printing is the most interesting part of the work. Several women in the larger studios receive from twelve to eighteen dollars each week. Girls who enter the work to mount the pictures should be alert, detect at a glance any imperfection, and must have artistic feeling. During the past thirty years there has been a demand for the application of color to photographs, and to-day hundreds of young women are devoting themselves to supplying the demand. The technique of the work is simple. Many women earn from twelve to fifteen dollars a week by executing orders. After a short course of study they are able to earn more. A knowledge of drawing is necessary, or the artist is unable to produce form, and the work is flat or distorted; there must also be a knowledge of color, or the tints will be dry and hard. One young lady of the East has supplied the teachers of schools with figure subjects. She has reproduced with exactness the little dramas and comedies of life. Here there are pictures of boys, their work and pastimes; school girls in their natural pleasures or duties. Kites, hoops, marbles, tops, dogs, are all so truthfully pictured that the teacher is seldom required to tell long stories for the children's amusement and instruction, for the photograph's explanation is clear, and from these the numerous stories are told or written. Another young woman with her camera has reproduced engravings, and her copies of famous old pictures in European galleries and prized ones in America, have earned for her reputation and profit. One woman makes a specialty of children's photographs, another confines her work to landscapes, a third takes photographs of interesting events in the city and sends them to the illustrated papers. Everywhere in the scientific world the power of the photographic camera has been felt. Physics, Chemistry, Mechanics, Astronomy, Zoology convince one that by patience and study a woman may put her camera to a most excellent use. Many eminent scientists are constantly preparing and publishing scientific papers. However perfect their language may be, however clearly their thoughts may be expressed, the words are often found inadequate to convey an actual visual impression. These papers, to satisfy the public and make the thoughts of more value, should be illustrated. The old illustrations of mammals, birds, reptiles and fish are frequently untrue, misshapen representations. 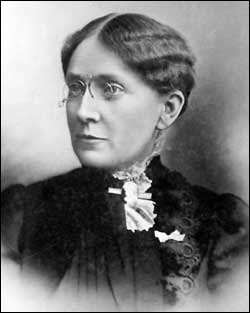 The young woman whose photographic work possesses merit and accuracy may in this field pursue her work to most profitable ends and to the advancement of learning. This field is full of interest to the gifted young photographer, but one in which ingenuity is demanded. This is an age of books and book illustrations. The various processes of book illustration are annually enriched by new applications of photography. The present knowledge of the flights of birds and the motions of animals can be produced by the camera in a most accurate degree. Here the young woman may choose her work, and if she would succeed she must strive for the best and seek to do not only good work but a superior quality of work. Willard, Frances Elizabeth. Occupations for women: a book of practical suggestions for the material advancement, the mental and physical development, and the moral and spiritual uplift of women.Cooper Union, N.Y.: The Success Co., 1897. 504. Cameron, Julia Margaret. Self-Portrait. Date Unknown. Wikipedia. An addition to my new fascination with videos about old photographs. I spent Mother's Day afternoon again trying my hand at building a video. Here is another attempt. I have so much to learn, but I promised myself this would be the year I mastered some of the programs I am so fortunate to own. Here for your enjoyment are a few Mother's from another time. Caution to those who are at work. A music box plays in the video. Photographs of Mother's of Old. Marry the two fastest growing avocations and what do you have? Heritage Scrapbooking. But just as your family has history, so does the pastime of scrapbooking. 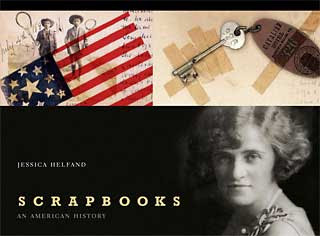 Take a look at this beautiful book and draw inspiration from the scrapbookers of old.